Epidemic outbreaks of multi-drug resistant (MDR) Acinetobacter baumannii (AB) in intensive care units (ICUs) are increasing. The incidence of MDR AB bacteremia, which develops as a result of colonization, is increasing through widespread dissemination of the pathogen, and further colonization. We sought to determine risk factors for MDR AB bacteremia in patients colonized with MDR AB in the ICU. We conducted a retrospective, observational study of 200 patients colonized with MDR AB in the ICU at Severance Hospital, South Korea during the outbreak period between January 2008 and December 2009. Of the 200 patients colonized with MDR AB, 108 developed MDR AB bacteremia, and 92 did not. APACHE II scores were higher in bacteremic than non-bacteremic patients at the time of ICU admission and colonization (24.0 vs. 21.6; P = 0.035, 22.9 vs. 16.8; P < 0.001, respectively). There was no difference between the two groups in the duration of time from ICU admission to colonization (7.1 vs. 7.2 days; P = 0.923), but the duration of time at risk was shorter in bacteremic patients (12.1 vs. 6.0 days; P = 0.016). A recent invasive procedure was a significant risk factor for development of bacteremia (odds ratio = 3.85; 95% CI 1.45-10.24; P = 0.007). Multivariate analysis indicated infection and respiratory failure at the time of ICU admission, maintenance of mechanical ventilation, maintenance of endotracheal tube instead of switching to a tracheostomy, recent central venous catheter insertion, bacteremia caused by other microorganism after colonization by MDR AB, and prior antimicrobial therapy, were significant risk factors for MDR AB bacteremia. Patients in the ICU, colonized with MDR AB, should be considered for minimizing invasive procedures and early removal of the invasive devices to prevent development of MDR AB bacteremia. Acinetobacter baumannii (AB) is emerging as an important pathogen, especially in intensive care units (ICUs). The increasing development of multiple antimicrobial resistances in this pathogen has severely restricted the therapeutic options available for infected patients, and increased the length of stay in ICUs and mortality [1, 2]. Despite intensive efforts, nosocomial acquisition of multi-drug resistant (MDR) AB is still a problem due to the great ability of AB to disseminate from and colonize human and environmental reservoirs [3, 4]. Various studies using different methodologies have analyzed risk factors associated with the acquisition of AB. Most of them have addressed factors that influence the risk of infection with MDR AB, comparing to infection with non-MDR AB, or non-AB [3–9]. These factors include prior colonization, which was independently related to the development of MDR AB bacteremia [3, 9], and colonization . However, there is limited data on risk factors associated with the development of MDR AB bacteremia from colonization in ICUs. Recently, major endemic and epidemic outbreaks of MDR AB have developed in critically ill patients throughout the world; aggressive control measures to prevent the transmission and colonization of this pathogen are currently limited. The incidence of MDR AB bacteremia has increased [10, 11]; thus, efforts to identify factors that influence the survival of patients with this pathology have been made [2, 12, 13]. It is known that mortality increases with each hour that appropriate antimicrobial therapy is delayed in patients with septic shock . In several studies, inappropriate, empirical, antimicrobial therapy was independently associated with poor clinical outcome, and early, appropriate, antimicrobial therapy was shown to improve survival in patients with an MDR AB bloodstream infection [2, 12, 13]. We conducted a retrospective, observational study among patients colonized with MDR AB admitted to our ICU to assess risk factors associated with the development of MDR AB nosocomial bacteremia. Knowledge of these risk factors will allow recommendations for preventive and therapeutic guidelines for the patients colonized with MDR AB. This was a retrospective, observational study of 200 patients colonized with MDR AB, admitted to the medical ICUs of Severance Hospital, Seoul, South Korea (a university, tertiary, referral hospital with two 15-bed medical ICUs) from January 2008 to December 2009. The outbreak of MDR AB infection has been developed in the ICUs since 2008. The finger print polymerase chain reactions for the isolated AB from the patients' blood and from the environment were randomly performed and the concordance in the types was observed. During the study period, a total of 903 patients were admitted to the ICUs. Screening cultures were performed in blood, urine, and sputum/endotracheal aspirate for all the patients at the time of ICU admission. During the ICU stay, additional cultures were performed every 4 to 5 days and when infection signs such as systemic inflammatory response syndrome were newly developed, or sustained for more than 3 days after antibiotics change, or when clinical deterioration such as worsening of fever, respiratory condition, and/or radiographic status, requiring mechanical ventilation, requiring aggressive fluid resuscitation or vasopressors were observed. Of 903 patients, 208 (23.0%) were discharged within 48 h of ICU admission, 22 (2.4%) had been previously colonized by MDR AB before ICU admission, 257 (28.5%) had never been colonized by MDR AB, and 416 (46.0%) were isolated with MDR AB after ICU admission. Of these 416 patients, 216 (23.8%) were excluded because they showed the possibility of infection with MDR AB, according to the surveillance definition of the Centers for Disease Control and Prevention/National Healthcare Safety Network . Twenty-three patients developed AB bacteremia without prior colonization and 6 patients developed non-MDR AB bacteremia. After excluding these patients, the study population consisted of the remaining 200 patients colonized with MDR AB (Figure 1). All of the colonization was diagnosed by endotracheal aspirate culture and colonization of 18 patients by urine culture at the same time. Summary of the study design. ICU intensive care unit. MDR multi-drug resistant. AB Acinetobacter baumannii. Baseline characteristics and various risk factors were compared between bacteremic and non-bacteremic patients. The risk factors were as follows: underlying illness, primary ICU admission diagnosis, acquisition types of infection, Acute Physiological Assessment and Chronic Health Evaluation (APACHE II) score, duration of hospitalization, recent invasive procedures, presence of invasive devices, prior antimicrobial therapy, immunosuppression, and bacteremia due to other pathogens before and after colonization by MDR AB. This study protocol was approved by the Ethical Review Committee of Severance Hospital. Colonization was defined as the presence of microorganisms on skin, on mucous membranes, in open wounds, or in excretions or secretions but are not causing adverse clinical signs or symptoms according to the surveillance definition of the Centers for Disease Control and Prevention/National Healthcare Safety Network . Nosocomial ICU-acquired bacteremia was defined on the basis of the isolation of one or more microorganisms from blood cultures 48 h after admission to the ICU with systemic inflammatory response syndrome (SIRS) . SIRS was defined as the presence of microbes or their toxins in the blood, or two or more of the following conditions: (1) body temperature > 38°C or < 36°C; (2) leukocytosis (> 10,000/mm3), leucopenia (< 4,000/mm3), or > 10% bands; (3) heart rate > 90 beats/min; or (4) respiratory rate > 24 breaths/min . Only the first isolation was considered. The duration of exposure to risk was defined as the time from colonization to the date a positive-culture was obtained for MDR AB for bacteremic patients, or the date of discharge from the ICU for non-bacteremic patients. The microorganism was defined as MDR if it was not susceptible to more than three of the following eight antimicrobial agents: ampicillin/sulbactam, aztreonam, ceftazidime, ciprofloxacin, gentamicin, imipenem, piperacillin, and trimethoprim/sulfamethoxazole [18, 19]. Antibiotic sensitivity was determined using the disc diffusion method, according to the Clinical and Laboratory Standards Institute guidelines . The significant coagulase-negative Staphylococcus (CNS) bacteremia was defined as isolation of the microorganism from 2 different blood cultures and showing clinical signs of infection at the same time. Immunosupression was defined as a history of any of the following: corticosteroid therapy for 15 days (at least 10 mg/day of prednisone or an equivalent drug), seropositivity for human immunodeficiency virus, solid organ transplantation, bone marrow transplantation, radiation therapy or chemotherapy for an underlying malignancy during the 6 months prior to hospital admission, and acquired immune deficiency disorder (hypogammaglobulinemia, combined variable immunodeficiency). Neutropenia was defined as absolute neutrophil count < 1,500 cells/μℓ blood. Prior utilization of healthcare services included ICU admission or hospitalization within 90 days of the present ICU admission. Recent invasive procedure was defined as the use of an invasive procedure (arterial catheter, central venous catheter, abdominal drainage catheter, thoracic drainage catheter/tube, nasogastric tube, urinary catheter, continuous renal replacement therapy (CRRT), peritoneal dialysis, tracheostomy, and endotracheal tube) within the 48 h preceding the date of the positive culture for MDR AB for bacteremic patients, or the date of discharge from the ICU for non-bacteremic patients. The presence of an invasive device was defined as having a device related to the invasive procedure for at least 48 h within the 2 weeks preceding the date of the positive culture for MDR AB for bacteremic patients, or the date of discharge from the ICU for non-bacteremic patients. Prior antimicrobial therapy was defined as the use of a systemic antimicrobial agent for at least 72 h within the 2 weeks preceding the date of the positive-culture for MDR AB for bacteremic patients, or the date of discharge from the ICU for non-bacteremic patients. Distribution of continuous variables was tested, and that normally and non-normally distributed variables are presented as mean ± standard deviation and median (interquartile range), respectively. Categorical variables were analyzed using the χ2 test or Fisher's exact test, and continuous variables were analyzed using Student's t-test or Mann-Whitney U test. Multivariate analysis was performed using a logistic regression model with interaction impacts to estimate the risk factors of occurrence of MDR AB bacteremia and is presented with an odds ratio (95% confidence intervals, CI). Potential candidate variables were those with P < 0.05 in univariate analyses. All tests were two-sided, and a p-value < 0.05 was deemed to indicate statistical significance. SPSS 12.0 (SPSS, Chicago, IL, USA) was used for all statistical analyses. Baseline characteristics of the study population are shown in Table 1. Of the 200 patients colonized with MDR AB, 108 (54.0%) developed MDR AB bacteremia, and 92 (46.0%) did not. Among 108 episodes of MDR AB bacteremia, carbapenem sensitive AB was observed in 15 (13.9%) patients. There was no difference between the two groups in terms of age or gender. Significantly more patients with bacteremia had malignancies and organ/bone marrow transplants as underlying illnesses, and significantly more patients without bacteremia had central nervous system disorders. The most common reason for ICU admission in both groups was infection. Infection (94.4% vs. 71.7%; P < 0.001) and respiratory failure (39.8% vs. 8.7%; P < 0.001) were more frequently observed in bacteremic than in non-bacteremic patients. Infection in 56.1% of non-bacteremic patients was community-acquired, and in 45.1% of bacteremic patients was hospital-acquired (P = 0.037). Table 2 shows the univariate analysis of risk factors related to clinical characteristics. Immunosupression, neutropenia, and APACHE II score at ICU admission were significant risk factors. APACHE II score, shock, and acute renal failure at the time of colonization were significantly correlated with the development of MDR AB bacteremia. After colonization, it took about 6 days to develop bacteremia. The duration of time at risk was longer in non-bacteremic patients than in bacteremic patients (12.1 ± 19.3 vs. 6.0 ± 11.1 days; P = 0.016). The intubation rate was not different between the groups, but maintenance of mechanical ventilation was a significant risk factor, with an odds ratio of 31.2 (95% CI 14.14-68.83; P < 0.001). Furthermore, the longer the mechanical ventilation was maintained, the further the progression of bacteremia (odds ratio = 1.04; 95% CI 1.01-1.08; P = 0.018). It took about 7 days to be colonized with MDR AB from the time of ICU admission in both groups. b Immunosupression was defined as a history of any of the following: corticosteroid therapy for 15 days (at least 10 mg/day of prednisone or an equivalent drug), seropositivity for human immunodeficiency virus, solid organ transplantation, bone marrow transplantation, radiation therapy or chemotherapy for an underlying malignancy during the 6 months prior to hospital admission, and acquired immune deficiency disorder (hypogammaglobulinemia, combined variable immunodeficiency). Table 3 shows the univariate analysis of risk factors related to recent invasive procedures and the presence of invasive devices. Receipt of any one of the invasive procedures within 48 h of the date of a positive-culture for bacteremic patients or the date of discharge from the ICU for non-bacteremic patients, was a significant risk factor for MDR AB bacteremia (odds ratio = 3.85; 95% CI 1.45-10.24; P = 0.007). Patients in whom either an arterial catheter or a central venous catheter was inserted, or patients who received CRRT were at risk of MDR AB bacteremia. Among the inserted invasive devices, central venous catheter, CRRT catheter, and thoracic drainage catheter/tube were significant risk factors. Patients in whom an endotracheal tube was maintained developed MDR AB bacteremia significantly more than those who were switched to a tracheostomy tube. Table 4 shows risk factors related to bacteremia caused by other microorganisms before and after colonization by MDR AB. Bacteremia developing in both periods was a significant risk factor for MDR AB bacteremia, with odds ratios of 2.59 (95% CI 1.35-4.99; P = 0.004) and 3.06 (95% CI 1.48-6.36; P = 0.004), respectively. Before colonization by MDR AB, bacteremia caused by other microorganisms was observed in 37.0% of bacteremic and 18.5% of non-bacteremic patients. CNS (38.0%) was the most common pathogen in bacteremic patients, and fungus (23.5%) in non-bacteremic patients. During the period of time at risk after colonization, bacteremia was observed in 31.5% of bacteremic and 13.0% of non-bacteremic patients. Enterococcus species (51.5%) were most commonly isolated from bacteremic patients and CNS (33.3%) from non-bacteremic patients. Table 5 shows risk factors related to prior antimicrobial therapy. The average number of prior antimicrobials used was 3.8 in bacteremic patients and 2.7 in non-bacteremic patients (P < 0.001). Quinolones, carbapenems, glycopeptides, and aminoglycosides were more frequently used in bacteremic than in non-bacteremic patients. Table 6 shows the results of the multivariate analysis of risk factors for MDR AB bacteremia. Five independent risk factors associated with MDR AB bacteremia were identified: ICU admission due to infection (odds ratio = 12.04; 95% CI 1.79-80.74; P = 0.01), ICU admission due to respiratory failure (odds ratio = 9.35; 95% CI 2.16-40.45; P = 0.003), recent central venous catheter insertion (odds ratio = 10.40; 95% CI 1.98-54.75; P = 0.006), bacteremia caused by other microorganisms after MDR AB colonization (odds ratio = 4.89; 95% CI 1.37-17.47; P = 0.014), and number of prior antimicrobials used (odds ratio = 2.12; 95% CI 1.33-3.39; P = 0.002). The interaction was observed only between the variables of maintenance of mechanical ventilation and maintenance of an endotracheal tube instead of switching to tracheostomy, but combined two factors was a significant risk factor for MDR AB bacteremia (odds ratio = 16.64; 95% CI 1.64-168.83; P = 0.017). This was a retrospective, observational study to determine risk factors for MDR AB nosocomial bacteremia in patients colonized with MDR AB after ICU admission. Our study showed that the presence of infection and respiratory failure at the time of ICU admission, recent central venous catheter insertion, bacteremia caused by other microorganisms after colonization by MDR AB, and prior antimicrobial therapy, were the independent risk factors for MDR AB bacteremia. Moreover, combined factors of maintenance on a mechanical ventilator and maintenance of an endotracheal tube instead of switching to a tracheostomy, increased the risk of MDR AB bacteremia. Risk factors for AB bacteremia in the ICU have previously been demonstrated with case-control and cohort methodologies. Multivariate analysis identified male gender, APACHE II score, length of stay in the ICU, mechanical ventilation, prior infection, antimicrobial therapy, prior colonization, and colonization pressure as independent risk factors for AB bacteremia [4, 6, 7, 9]. Recently, epidemic outbreaks of MDR AB have occurred in different areas of hospitals, primarily the ICU, with widespread dissemination and colonization [10, 19]. However, knowledge of which patients previously colonized with MDR AB would develop bacteremia in the ICU has been limited. Awareness of the risk factors would help predict bacteremia in colonized patients and allow administration of appropriate antibiotics before culture results are reported. Delay in appropriate antimicrobial therapy has an adverse influence on the clinical outcome of patients with AB bacteremia [12, 13, 18]. Consistent with other studies [3, 4], we found the presence of infection at the time of ICU admission, and bacteremia caused by other microorganisms after MDR AB colonization, independently increased the risk of MDR AB bacteremia 12-and 5-fold, respectively. Infection accompanied by bacteremia caused by other microorganisms reflects underlying disease severity or a requirement for critical care, including invasive interventions. These risk factors are also related to the number of previous antimicrobials used which increased the risk of MDR AB bacteremia by 2-fold in the present study. Treatment with a greater number of broad-spectrum antibiotics is a surrogate marker of illness severity, and could ablate a patient's pre-existing microflora. Duration of exposure to previous antimicrobials was significantly shorter in bacteremic than in non-bacteremic patients, but this result was due to shorter duration of risk exposure. Therefore, the number of previous antimicrobials used at least 72 h within 2 weeks were analyzed in this study. Our data showed combined factors of maintenance of mechanical ventilation and maintenance of an endotracheal intubation tube without a switch to tracheostomy, increased the risk of bacteremia by almost 17-fold. Mechanical ventilation is the main source of transmission of AB, and AB colonization in the respiratory tract. Tracheobronchitis and pneumonia are known to increase the risk of secondary bacteremia caused by AB in other studies [4-6, 21-23]. In a univariate analysis of risk factors, it was reported that tracheostomy was a significant risk factor for AB colonization . In the present study, it was not identified as a significant risk factor, because only a small number of recent tracheostomies was included. Recent central venous catheter insertion increased the risk of bacteremia by almost 10-fold. Central venous catheter insertion has previously been reported as a risk factor for AB bacteremia on the basis of univariate analyses [2, 6, 24]. In this study, using multivariate analysis, it was a significant independent risk factor. The difference is a result of the different types of patients included in the study populations; previous studies compared patients with and without infection of MDR AB. All patients in this study were colonized by MDR AB; thus, the risk of development of bacteremia due to invasive procedures was significant. As with many other invasive procedures, central venous catheter insertion is a major portal of entry as a source of infection . Arterial catheter insertion was a significant risk factor on the basis of a univariate, but not a multivariate, analysis. Although both procedures are performed via a vascular access, the sizes of the puncture needle and guide sheath/wire differ. The chances of developing blood stream infections depend on the length of the devices used and the duration of the procedures. Previous reports were unclear as to whether a longer stay in the ICU would increase the risk for bacteremia [3, 7, 8, 25–27]. Many other possible risk factors for nosocomial MDR AB bacteremia in the ICU are related to length of hospitalization. To control for the duration of time at risk, we included the time from colonization to the date of a positive-culture for MDR AB for bacteremic patients or to the date of discharge from the ICU for non-bacteremic patients in the final multivariate analysis. The results showed that the duration of exposure to risk was not an independently significant risk factor; in fact, univariate analysis showed it was actually shorter in bacteremic than in non-bacteremic patients. 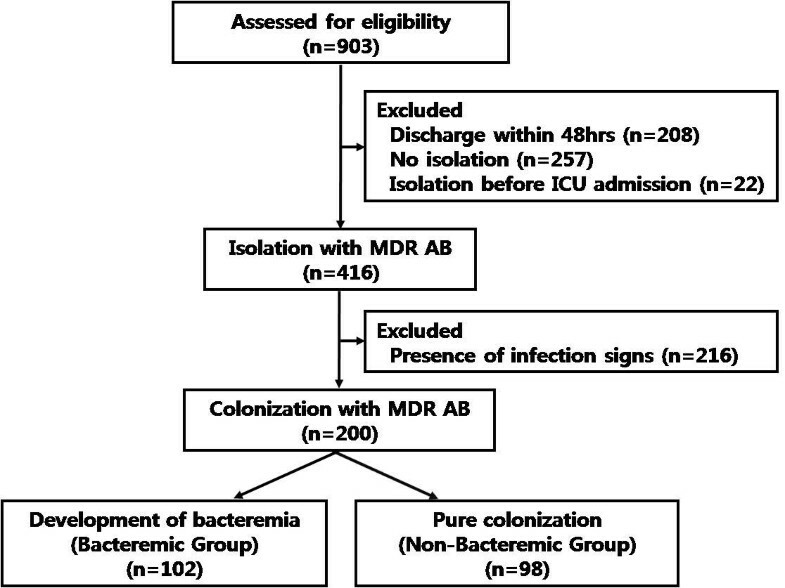 As all the patients in this study were already colonized with MDR AB, the length of stay in the ICU did not affect the development of MDR AB bacteremia; even with a short duration of stay, patients requiring acute care and those maintaining mechanical ventilation and receiving invasive procedures developed bacteremia more frequently. AB infection or colonization is associated with increased mortality, morbidity, and a prolonged length of stay in the hospital, leading to excessive medical costs [19, 25]. Reducing intrinsic contamination and colonization of medical equipment or devices used for monitoring and therapy of patients, and decreasing contamination through airborne or direct contact with patients must be the primary measure used to control the infection of MDR AB in the ICU. Furthermore, attention to various guidelines for the use of care bundles in critical care, such as ventilator bundles, central line bundles, and severe sepsis bundles is important for the prevention of bacteremia in clinical practice, especially for patients colonized with MDR AB. Moreover, efforts to remove invasive devices and equipment such as endotracheal tube or central venous catheter as soon as possible are needed to prevent development of MDR AB bacteremia among the colonized patients [2, 12, 13]. There are several limitations to the present study. First, this study was processed in a retrospective observational manner; thus, methodological deficiencies in assessing risk factors for MDR AB acquisition may lead to biased estimates or erroneous associations. However, number of patients in this study is larger than previous studies [3, 6, 21], so potential for bias is expected to be minimized. Second, since active surveillance culture for the presence of AB was not routinely and uniformly performed during ICU stay, not all the patients with colonization may have been included in this study and there may be inaccuracy in the timing of colonization. Third, because outbreak of MDR AB was developed during the study period, this result may not represent overall status of MDR AB bacteremia of the patients with prior colonization in general ward or other intensive care units. Lastly, although we followed the definition of the Centers for Disease Control and Prevention/National Healthcare Safety Network to select the patients colonized by MDR AB, some of the patients included in this study might have been infected with MDR AB, while some of those that were excluded might have been colonized by MDR AB. In conclusion, this study demonstrated the several risk factors for MDR AB nosocomial bacteremia in patients with MDR AB colonization in the ICU. Independent risk factors were the presence of infection and respiratory failure at the time of ICU admission, maintenance of mechanical ventilation, maintenance of an endotracheal tube instead of a switch to a tracheostomy, recent central venous catheter insertion, bacteremia caused by other microorganism after colonization with MDR AB, and prior antimicrobial therapy. Patients in the ICU, colonized with MDR AB, should be considered for minimizing invasive procedures and early removal of the invasive devices or equipments to prevent development of bacteremia . The authors are indebted to all who participated in this study. Thanks to all the health care professionals of the Severance Hospital, and specifically those from the medical intensive care units. JJ carried out screening and acquisition of data, statistical analysis and participated in the writing of the manuscript. SEK, SKL and SHL carried out screening and acquisition of data. BP, JS, EK participated in the acquisition of data and statistical analysis. JL, KL participated in the interpretation of data. YK participated in the study design and the analysis and interpretation of data. SKK and JC participated in the study design, analysis and interpretation of data and critical revision of the manuscript for important intellectual content. MP and YK participated in the study design, analysis and interpretation of data and the writing of the manuscript. All authors read and approved the final manuscript.